Remember Bloom’s Taxonomy? It’s that handy tool that helps you create measurable learning outcomes. What if there was an easy way to match your learning goals to tools that support your students’ learning at each level of Bloom’s Taxonomy? And what if those tools were free? Enter Google Blooms, assembled by Kathy Schrock. 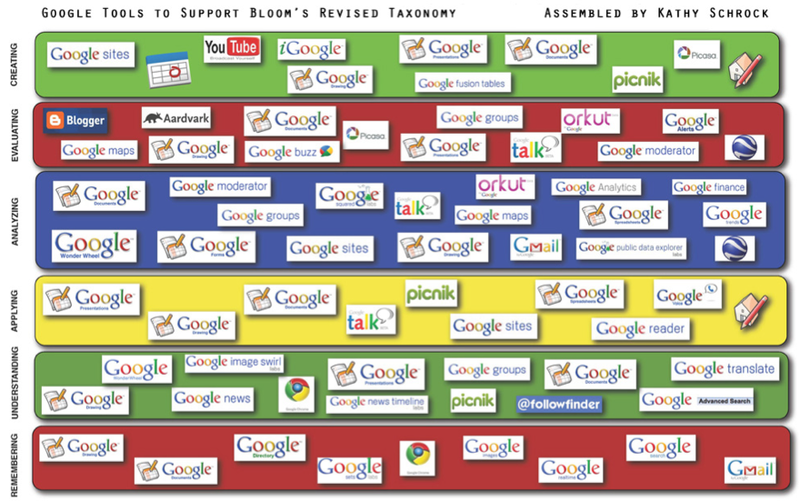 Kathy’s created a clickable image map that matches 51 of Google’s tech tools/toys to each level of the revised Bloom’s Digital Taxonomy. I thought I’d tried most of Google’s free tools, but there are some on here I’d never heard of. I’m looking forward to playing with the new ones and hopefully integrating some of them into future classes. Visit Kathy’s original image to mouseover each tool name to visit and try out each tool. I love trying out new (to me) tools for teaching and learning. I was looking for a way to model “Active Learning” — this idea that students learn when they’re engaged in the process of learning. I found “Spicy Nodes” and voilà: a visualization of active learning was born. Click on the various “nodes” or bubbles to expand and see what’s buried beneath. Continue clicking on each node until it goes no further. You might find you’re actively learning about active learning. (Woah — that was kind of meta!) Go ahead and try out the tool yourself. There are both free and premium accounts available.